Visix adds the new Nano player to its digital signage hardware providing a small and affordable media player with robust features. 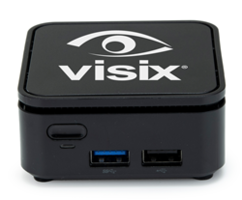 Visix has added a new Nano player to its digital signage hardware offering. The ultra-small form factor appliance is purpose-built to provide reliable 1080p playback for digital signs in the smallest package available, measuring just 2.75 inches square.